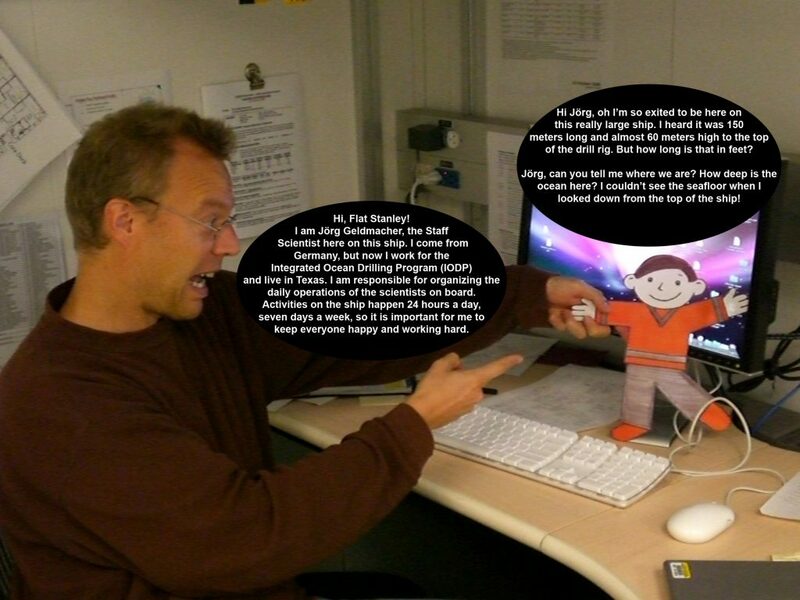 Hi Flat Stanley, I am Joerg Geldmacher, the Staff Scientist here on this ship. I come from Germany, but now I work for the Integrated Ocean Drilling Program (IODP) and live in Texas. I am responsible for organising the daily operations of the scientists on board. Activities on the ship happen 24 hours a day, 7 days a week, so it is important for me to keep everyone happy and working hard. Hi Joerg, oh I’m so excited to be here on this really large ship. I heard it is 150 meters long and almost 60 meters high to the top of the drill rig. But how long is that in feet? Joerg, can you tell me where we are? How deep is the ocean here? I couldn’t see the seafloor when I looked from the top of the ship!